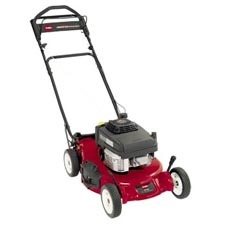 TORO PT21 21" COMMERCIAL LAWNMOWER , is what I bought .This model machine, the 22163 6.0 hp Kawasaki FJ180V engine, Hand Push, Zone Start, is a 21" commercial trim mower . The things I checked when I bought it was its price and warranty to the most important part. It seemed very worth, and it came with Toro factory warranty. I was pleased. When I started working with it, it felt very light, I never guessed so light in weight .I really enjoy this mower as it has worked flawlessly day in and day out. It handles my lawn with ease. I usually mow twice a week but sometimes I go more than a week and it handles it fine unlike my old mower. The cut was really outstanding, The trim was very well cut. The safe handle and easy control really impressed me. Even though I have not used it much , but its 1 year in my hand has been good with no flaw. The hand push is really fitting for me and my lawn style but just remember that they require the extra effort to push and can be heavy at times. The mulching performance is incredible. I really like the Personal Pace self-propelled feature. I don't use it within inches of young trees of course, where I pull the handle back to disengage the drive and maneuver using the steel handle that is not connected to the drive mechanism. The most important thing I like about this is, I had no money spent on its maintenance till now. I almost changed the oil the other day, but it was still a nice yellow-amber color so I let it be. This lawn mover is a real craftmenship indeed , but still the noise is little higher than the electric lawn movers I have seen . it is more powerful than other type of mowers. But I m really glad I bought this, a good quality land mover/trim. Overall the performance is excellent.